If you are a frequent visitor of this fine website you probably fancy yourself a fan of European sport wagons. I know I do. Now perhaps you are in the market for a BMW longroof that is both unique and insanely expensive. Well, friend, have I found the place for you! 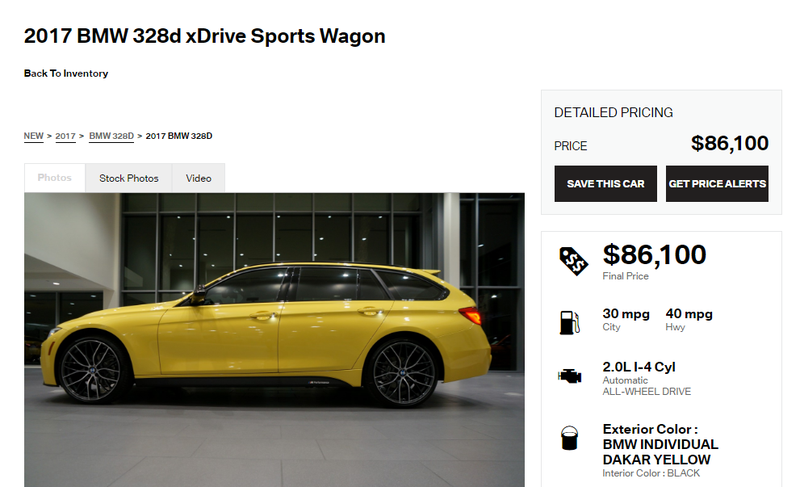 Awhile back I spotted this absolutely crazy BMW 330xi Sport Wagon with pretty much every option and accessory possible—and a custom paint scheme—for a whopping $73,237. Now, I really like the F31 series wagon. So much so I almost considered buying one, but I just wasn’t ready to give up driving a manual transmission, and these days those are automatic only in the U.S. But despite my irrational love for wagons, I just couldn’t fathom spending this much money on something with only 240 horsepower especially when much faster longroofs could be had for the same money. After that post went up I got a note from one of the sales managers at the shop, Century West BMW, explaining exactly why the car was so expensive. He said that there are many customers in that area willing to pay quite a bit more for “something special,” and swore he had a market for such cars. I guess that makes sense. Los Angeles is one of the hottest luxury car markets in the country. Logically it would follow that there would be customers in the area with money to burn on uniquely spec’d BMW wagons with wild colors. I mean you can’t just roll up to Starbucks in a plain old 3 Series, in LA you have to make a statement. That’s a rose quartz metallic AND yellow wagon both over $80,000, plus two more in slightly more normal colors and that not-at-all-normal wagon price tag. Say what? Now if wagons aren’t your thing and you would like to spend almost $120,000 on a Miami Blue M3, that is available as well. These prices may not make much sense to be, but who am I to hate on it? There are worse things to spend too much money on. Or maybe I’m just being trolled at this point. At any rate, if statement-making wagons are your thing in LA, hit up this shop.